Got to sign in for some reason,. so Hi Hal and all. 1:45 Not too far in the outback with that green grass, fence and trees around it. I always feel a little sad when I see these derelict houses on the prairies. I can't help but wonder about the families that once called them home. Everybody!! Back from cribbage tourney. Did really, really bad in the main tourney, winning only 5 of 14 games. On the other hand, was top qualifier in the Consolation tourney winning 7 of 8 games! Whew! I play a lot of cards, Denny, and I know that some days it is just, ''it is what it is''. Glad you rocked the Consolation tourney! Today's buffet also includes chicken and rice, mac and cheese, mashed potatoes, green beans, corn on the cob and various desserts. I think someone was going to try a salad again. They never seem to touch those. We shall see. Hey, DOA ... I have a strong, ex-soccer-player right foot that could give you a good kick you-know-where! Sunny & hot, hot, hot! Hope your day is sunny & mild! Jerry, as I said yesterday... not a good time to have airplane jokes! Oops! Where'd that name come from? I meant Devil or Angel! Bev, we drive past a gorgeous brick house on the way to visit my son. It has wonderful brick architectural details. No one has lived there for at least the 20 years we've been driving by. We've watched it steadily fall into ruin. It is sad to think of the care and cost of that house when it was first built - probably in the late 1880's. Haha - that was funny, Shiela… - thought you'd just revealed DoA's 'real' name! 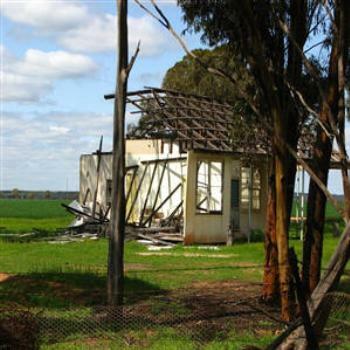 What always fascinates me are the out-buildings crumbling around a well-maintained farm house; can only gather that they are no longer doing any farming & have no need for them. Although, now the timber is being collected by woodworkers to re-purpose into paneling, cabinetry, furniture, cutting boards, exotic bowls - maybe the owners are hoping to watch their fortune grow! Sad to see an old house just left in ruins. Morning all,it's sad to see old houses left to just fall apart. 1:08, a nice quick one this morning. Hi everyone. More a former house, I'd say, rather than an old house. I did not rain today - YAY! - but it is hot, not nice out, and rain is possible again tomorrow. Oh, no, the weather report is now for thunderstorms this evening! We have had enough!! One of the news guys said it has been raining for 100 days. That's not true, but sure does seem like it.